Natuzzi B995 Tullio, Home Cinema Seating Sofa or comfort station with sofa-bed. With the latest styling ethos featuring tall vertical and slim high arms, the Natuzz B995 Tulli is a truly versatile sofa. Available with a drinks holder mid seat console, featuring a touch operated LED reading lamp and storage. Configured with consoles, left and right arm sections and armless mid seats, the B995 Tullio makes a superb addition to the Furnimax cinema sofa and seating range. 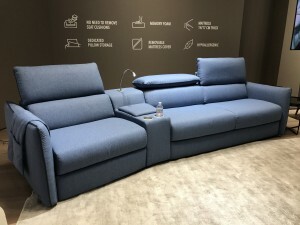 The availability of a roll forward sofa bed which transformes into a full-size bed within five seconds, featuring a thick Italian foam mattress and excellent comfort makes this set very popular as a lounge comfort station that is also then as a spare bedroom. NATUZZI EDITIONS MODEL NO B995 ITALIAN CRAFTSMAN CORNER RECLINING LEATHER SOFA. NATUZZI EDITIONS MODEL NO B995 ITALIAN RECLINING LEATHER SOFA GIVES YOU TOTAL CONTROL, ITALIAN TASTE, STYLE, DESIGNED FOR THE LIFE THAT YOU LOVE. NATUZZI EDITIONS MODEL NO B995 ITALIAN CRAFTSMAN RECLINING LEATHER OR FABRIC SOFA HAS BEAUTIFULL SLENDER ARMRESTS, REFINED PIPING AND IS LOVELY AND COMFORTABLE. TULLI B995 HAS AN OPTION TO ADD A FULL-SIZED SOFA BED OR A CONSOLE FOR DRINKS WITH READING LAMP AND STORAGE.